JANSSONIUS -Asia Recens Summa Cura Delineata Auct. Iud Hondio. JANSSONIUS, J. - Asia Recens Summa Cura Delineata Auct. Iud Hondio. Asia Recens Summa Cura Delineata Auct. Iud Hondio. - JANSSONIUS, J. Title : Asia Recens Summa Cura Delineata Auct. Iud Hondio. . Size : 15.9 x 21.9 inches. / 40.5 x 55.5 cm. Description :This is the rare early issue with "carte à figures". Originally engraved with plans of 6 towns at the top and bottom, c1630, this edition was printed after the lower border had been cut off (in order to fit more conveniently into the standard folio atlas of the time). Five panels on each side show figures in national costume. 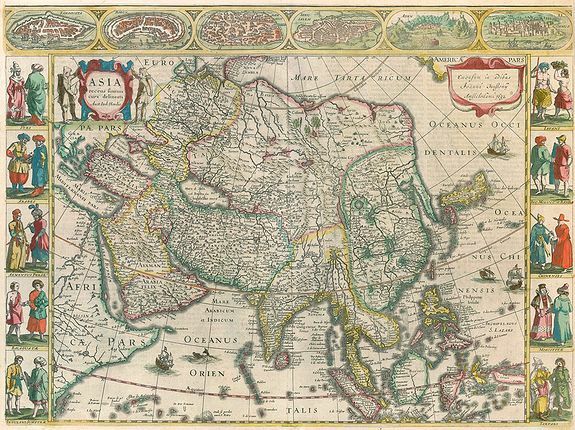 Only issued in a few editions of the Mercator/Hondius/Janssonius atlas. Condition : Upper right margin trimmed to neatline. Lower centrefold split reinforced with some retouching of the yellow colour at the lower margin (ca. 2cm).